Yes, the Skeleton team is hoping to add a new and brilliant person to our ranks. 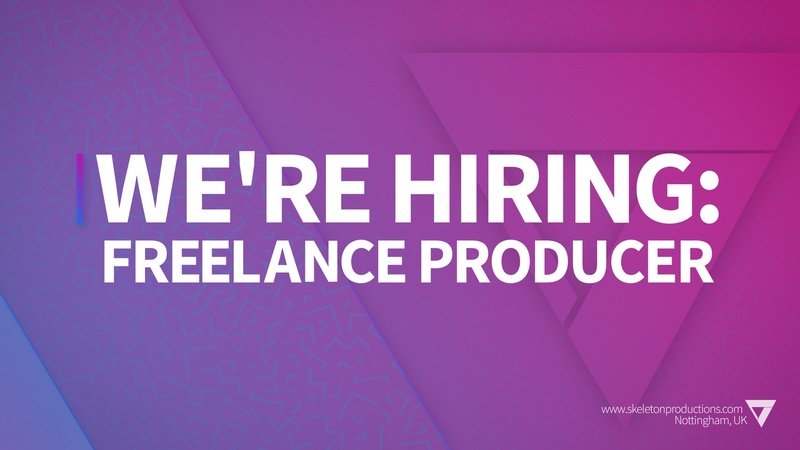 We're looking for Freelance Producers to help us in delivering outstanding customer service to our clients. RECRUITMENT AGENCIES PLEASE DON'T EVEN TRY OR WE WILL SET OLLIE ON YOU! Hi. We’re Skeleton, a video production agency that crafts creative and engaging videos for our clients. We’re a friendly, close-knit team of specialists who believe in continually learning and pushing ourselves. We help diverse businesses & brands from all over the globe to get the most from video (think Boots, Experian, and Box). Our aim is to become the UK’s most-loved B2B video agency famous for our creativity, customer service, and the amazing results we achieve for our clients. We’re looking for a talented freelance producer with the ability to support in the production of live action and animation projects, from pre-production through to production and post-production managment. You’ll be working in our colourful main office at the University of Nottingham’s Innovation Park (featuring inspirational fish tank and wall art). On a day-to-day basis you’ll be supporting our broader team as we work with key clients, from universities to FTSE 100 companies to startups, helping turn their ideas into beautifully appealing videos. In short: we’re looking for a talented, imaginative, passionate and experienced producer that is willing to work hard and where necessary learn fast. You enjoy working independently and as part of a team to solve exciting & challenging client problems. Manage and execute pre-production and production of shoots, including setup and filming. Experience writing concepts, outlines, and scripts. Visit our specially created APPLICATION FORM and fill in your details. We look forward to hearing from you!